More than 1000 Syrians stage a protest in Latakia, calling for the execution of a Assad’s cousin, who has been accused of killing an army officer in a road rage incident. The Syrian Observatory for Human Rights says more than 1,000 people gathered in the city holding up pictures of the victim. The demonstrators call for the execution of Assad’s cousin. They also chanted slogans in support of the president. Syria’s state media did not report the protest, the traffic incident or the reported killing. A cousin of Syria’s president shoots dead a senior air force officer in a road rage incident according to a monitoring group. Syrian Observatory for Human Rights says the incident happened when the cousin followed the officer because he overtook him at a crossroads, then swerved the car around, got out and shot him dead. The cousin has not been arrested. Obama authorizes using air power to defend a new U.S.-backed fighting force in Syria if it is attacked by Syrian government forces or other groups, raising the risk of the American military coming into direct conflict with the regime of Assad. Though the new rules allow Pentagon strikes to defend the U.S.-allied force against any regime attacks, U.S. military officials play down the chances of a direct confrontation. The newly trained force is committed to fighting Islamic State, not the Syrian regime, and won’t be fielded in areas the regime controls. U.S. officials say they believe the regime won’t challenge the new force. Assad says the Syrian army has been forced to give up areas in order to hold onto more important ones in its fight with insurgents, and the scale of the war means the military faces a manpower shortage. Sometimes, in some circumstances, we are forced to give up areas to move those forces to the areas that we want to hold onto. We must define the important regions that the armed forces hold onto so it doesn’t allow the collapse of the rest of the areas…Everything is available (for the army), but there is a shortfall in human capacity, Mr Assad said. Despite that, I am not presenting a dark picture. Assad says increased support from states backing the rebels is the reason for recent setbacks and dismisses the view that Syria is heading towards partition into areas run separately by the Damascus government and armed groups fighting him. He says amnesty for men at home and abroad who have dodged military service will encourage thousands of conscripts who want to join the army but hold back because of penalties. 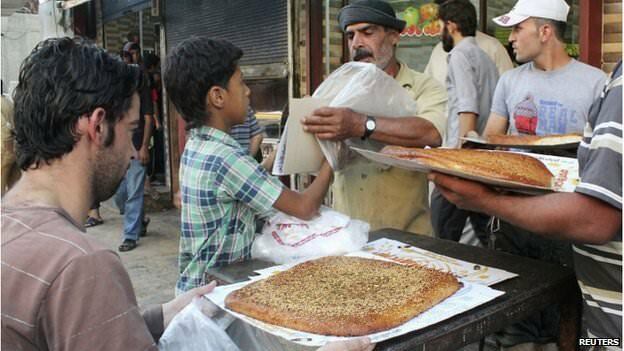 can be achieved through a political process undertaken by the Syrians themselves, under the auspices of the UN. a fundamental and comprehensive change of the current political regime, including the head of the regime and all its leaders, pillars and security agencies. agreed a road map for the salvation of Syria, including the basic principles of a political settlement, to be adopted by their respective competent bodies. 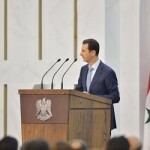 Assad orders the release of a revised version of the Koran in order to correct distortion and misleading lessons, announcing the changes on television with the Minister of religious endowments (Awqaf), and members of the Ministry’s Permanent Committee for the Holy Koran Affairs. The new version will contain simplified letters standardised by official accredited standards set by Koranic scholars. The government of Syria has indicated to me its willingness to halt all types of aerial bombing and artillery shelling for a period of six weeks, all over the city of Aleppo. We await a detailed proposal from [Mr.] de Mistura. We’ll study any proposal he puts forward carefully and in detail. The Assad regime’s compliance with any such proposal will be judged by actions, not words. And thus far, his actions have been only brutality and terror. 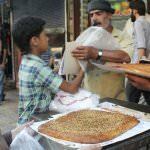 Judges in the European Union uphold EU sanctions against Mohammad Makhlouf, an uncle of Assad, dismissing his request to be removed from a list of Syrian figures banned from entering the EU and whose assets in the bloc are frozen. The court dismisses an argument that the sanctions breached ‘s right to privacy on the grounds that it prevents him from maintaining his family’s standard of living. Barrel bombs kill those we love most, they destroy houses, dreams and memories, and leave us without any hope that the killing will ever stop. Whereas previously the Syrian regime had some interest or some level of obligation to take direct action against ISIS, to the extent that the American military is now doing this, the Syrians don’t have to do it. If ever there was a time when the Syrian regime had everything lined up for them to do so, this is it. It is in a very favorable position and it’s got the opportunity to execute major offensives around Damascus and Aleppo. Action in Syria will be difficult to justify legally without a request for assistance from the Assad government, and it is unlikely that the West could be seen to be responding to such a request. The British Government has said that any action in Syria will comply with international law, and the most likely way to achieve this would be to claim that military action is for humanitarian purposes, using the Responsibility to Protect doctrine. This remains controversial, however, without a United Nations Security Council resolution to authorise it. There are rules of engagement any time that our men and women in uniform are put into harm’s way. And so there will be rules of engagement that are related to any military orders that the President directs – military actions that the President directs. So I’d refer you to the Department of Defense for a detailed assessment of that. But it won’t surprise you to know that there are contingencies related to self-defense when it comes to these sorts of rules of engagement. But I can say that while I think it is evident to anybody who is paying attention here that that is – indicates the President’s willingness to order the kind of military action that’s required to protect the lives of military – of American citizens, even if it means sending our military into Syria. This is not the kind of Iraq on fire, complete desperation we had during the surge. [ISIS] has nowhere the roots and the structure of al-Qaida in Iraq. It’s a new Iraqi government now. There’s new hope, there’s outreach. The third failing was the population was not happy with sectarian and loyalist leaders. This is going to be years, not months. The Organization for the Prevention of Chemical Weapons says it has ‘compelling confirmation’ that chlorine gas was used in fighting between regime forces and rebels in three rebel-held northern villages earlier this year. It says chlorine – a toxic gas that is not specifically classified as a chemical weapon – was used ‘systematically and repeatedly’ in fighting in the villages of Talmanes, Al Tamanah and Kafr Zeta. As chlorine is not strictly classified as a chemical weapon, the government is not required to report stockpiles of the gas. The Assad government and rebel groups have both accused each other of using chlorine in the villages. We have documented the deaths of 31 civilians, among them five women and three children, in Raqa and its surroundings. Another 15 militants are confirmed dead in a string of eight air strikes, as well as seven other unidentified people. Eight of the civilian victims are from one family. Twelve civilians, among them a child, were killed, and five others seriously wounded after helicopters launched two explosive-laden barrels against the Haidariyeh district. I saw the bodies. They were workers, people who were simply trying to find a way to put bread on the table… You can see the human remains. Taxi drivers gather here to transport workers and goods… There were no rebels here. 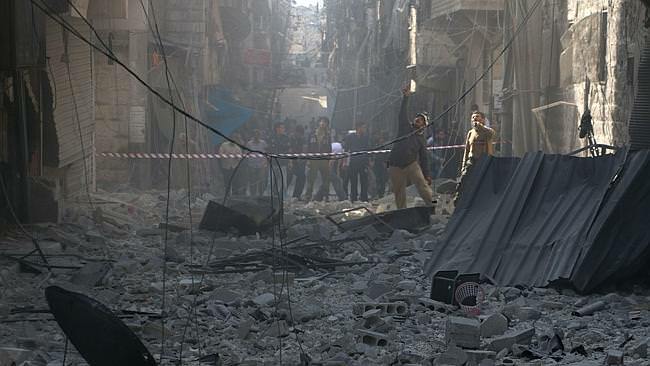 Assad regime airstrikes on an ISIS-operated training camp and bakery in Raqqa kill 25 people. 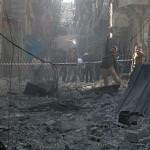 The Syrian Observatory for Human Rights says militants and civilians are among the casualties. ISIS operates a variety of assets in Raqqa – the capital of the self-styled Islamic State’s caliphate – including courts, a central bank and an administrative system. A report compiled by the Syrian Network for Human Rights says the Assad regime has tortured 5,281 people to death since the start of the uprising in 2011. It says the tortured include 94 children and 32 women, who died as a result of being tortured in jail. In August alone, the regime tortured 243 people to death, it says. I want to stress that much more work still needs to be done on Syria’s chemical-weapons program. We must ensure that the Syrian government destroys its remaining facilities for producing chemical weapons within the mandated time frames and without the repeated delays by the Assad regime that plagued earlier removal efforts. There are still some discrepancies or questions that are being asked. It’s a discussion that’s continuing in Damascus as well as the Hague. In the past just simply saying ‘my enemy’s enemy is my friend’ has led to all sorts of moral quagmires and difficulties. Assad has been part of the creation of Islamic State rather than being part of its answer. This issue is being addressed by the defence ministry and the army… At the same time, it is important to continue with national reconciliation. I declare the victory of Dr Bashar Hafez al-Assad as president of the Syrian Arab Republic with an absolute majority of the votes cast in the election. The first rocket was fired around 7:15pm, followed by another five minutes later. The rockets targeted a house where Hilal was holding a meeting with other members of the National Defence Army. Syrian Deputy Foreign Minister Mekdad is dismissive of Pillay’s remarks. She has been talking nonsense for a long time and we don’t listen to her. Assad pledges to continue fighting terrorist violence and urges foreign countries to end support for his enemies while also offering a national dialogue and a constitutional referendum to end Syria’s crisis. Assad uses an hour-long speech in Damascus to propose what he calls a comprehensive plan that includes an expanded government. He refers to plots against his country and the role of al-Qaida, long-portrayed as the leading element in the uprising. We are now in a state of war in every sense of the word, This war targets Syria using a handful of Syrians and many foreigners. Thus, this is a war to defend the nation. 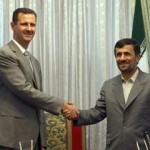 Assad also thanks Russia, China and Iran for supporting Syria in the face of hostility from the US, Britain and France. It’s the Turks who are militarily controlling it. Turkey is the main co-ordinator/facilitator. Think of a triangle, with Turkey at the top and Saudi Arabia and Qatar at the bottom. The Americans are very hands-off on this. U.S. intel are working through middlemen. Middlemen are controlling access to weapons and routes. The centre is located in the southern Turkish city of Adana, about 100 km (60 miles) from the border, and was set up after Saudi Deputy Foreign Minister Prince Abdulaziz bin Abdullah al-Saud visited Turkey and requested it. The Turks liked the idea of having the base in Adana so that they could supervise its operations. Because the Syrian first lady is a British national she cannot be prevented from entering the UK, but she cannot enter then other 26 EU states. The regime blames terrorists acting out a foreign conspiracy for the uprising, not protesters seeking change. The opposition rejects dialogue, saying it is impossible to talk to Assad’s regime. In an interview with Walters, Assad denies he is responsible for the violence engulfing his country and distances himself from the behavior of his armed forces. Turkey’s prime minister Ergodan calls on the Syrian president to step down. For the welfare of your own people and the region, just leave that seat…If you want to see someone who has fought until death against his own people, just look at Nazi Germany, just look at Hitler, at Mussolini, at Nicolae Ceausescu in Romania, If you cannot draw any lessons from these, then look at the Libyan leader who was killed just 32 days ago in manner none of us wished and who used the same expression you used. King Abdullah becomes the first Arab leader to openly say President Assad should stand down, urging Assad to begin talks on an orderly transition of power and warning there will be more of the same if whoever replaces him does not change the status quo. If Bashar has the interest of his country [at heart] he would step down, but he would also create an ability to reach out and start a new phase of Syrian political life. That’s the only way I would see it work and I don’t think people are asking that question. Syrian President Bashar Al Assad warns that foreign intervention in his country’s violent uprising could trigger an earthquake that would burn the whole region. Any action against Syria will have greater consequences [on those who carry it out], greater than they can tolerate. First, because of Syria’s geopolitical location and second [because of] Syrian capabilities. They know part of it but they do not know the other parts and they will not be able to afford the results. Assad says calls for his resignation by US and EU are not even worthy of a response, adding that he is appointed by the Syrian people, not by the West. President Obama says the regime’s actions against pro-democracy protesters have cost it all legitimacy. The future of Syria must be determined by its people, but President Bashar al-Assad is standing in their way. His calls for dialogue and reform have rung hollow while he is imprisoning, torturing and slaughtering his own people, We have consistently said that President Assad must lead a democratic transition or get out of the way. He has not led. For the sake of the Syrian people, the time has come for President Assad to step aside. UK Prime Minister Cameron, French president Sarkozy and German chancellor Merkel, as well as the EU also demand Assad immediately resign. Our three countries believe that President Assad, who is resorting to brutal military force against his own people and who is responsible for the situation, has lost all legitimacy and can no longer claim to lead the country. We call on him to face the reality of the complete rejection of his regime by the Syrian people and to step aside in the best interests of Syria and the unity of its people. Canada imposes sanctions on Syria in reaction to the ongoing government crackdown on pro-democracy activists. Foreign Affairs Minister Baird says four more senior officials of Assad’s regime are banned from travelling to Canada. In addition, the assets of the Commercial Bank of Syria and telecom company SyriaTel are frozen, and Canadians are prohibited from making transactions with these companies. To isolate the Assad regime, Canada is taking measures to extend its existing sanctions against the regime and its backers. The Assad regime has lost all legitimacy by killing Syrian men, women and children just to stay in power. This campaign of terror must stop. Syria’s government passes a law to lift the country’s state of emergency as protests against the rule of Assad continue. The state security court is abolished while a law allowing peaceful protests is approved. The repeal of the emergency law is a key demand of protesters. [The people should] refrain from taking part in all marches, demonstrations or sit-ins under any banner whatsoever. [If demonstrations are held] the laws in force in Syria will be applied in the interest of the safety of the people and the stability of the country. This great consensus shows the political maturity of Syria and the brilliance of our democracy. Assad and Asma Akharas marry in a secret ceremony in Damascus. No pictures are taken. The Syrian president al-Assad dies in Damascus of a heart attack. He is survived by four of his five children. His dynastic guidelines pass succession to his son, Bashar al-Assad.